Trascorri due giorni ad esplorare le regioni francesi della Normandia e della Bretagna con questo tour da Parigi con pernottamento a Caen. Visita le belle città storiche di Rouen e Honfleur, e i siti della seconda guerra mondiale tra cui le famigerate spiagge di sbarco del D-Day in Normandia e il Cimitero e il Memoriale americano. Il giorno dopo, visita la città portuale fortificata di Saint-Malo, con un tour di Mont Saint Michel a seguire, una delle attrazioni più simboliche della Francia. Pernottamento, pasti, biglietti di ingresso e trasporti sono inclusi. Well planned,well organized, and well executed. The best part of our trip was Dominique, our guide, who was incredibly meticulous about the details and getting everyone around to everything. She was an endless source of knowledge about all of the places we visited and offered such great explanations about everything. I was concerned beforehand that we would feel rushed, but we had plenty of time to see what we wanted to. I was a little disappointed about not spending more time in Normandy, and not having time to see a museum there.Wonderful overall experience though. We signed up for this tour primarily to see Mont-St Michel, and the Mont did not disappoint. It is worth the trip, but in fact there were other stops covered on this tour that were as important and worthwhile. The walking tour of old Rouen was a superb introduction to a city that is often overlooked (a fine old cathedral, a stunning modern church dedicated to St. Joan of Arc, half-timbered houses, a fine old clock, good shops). 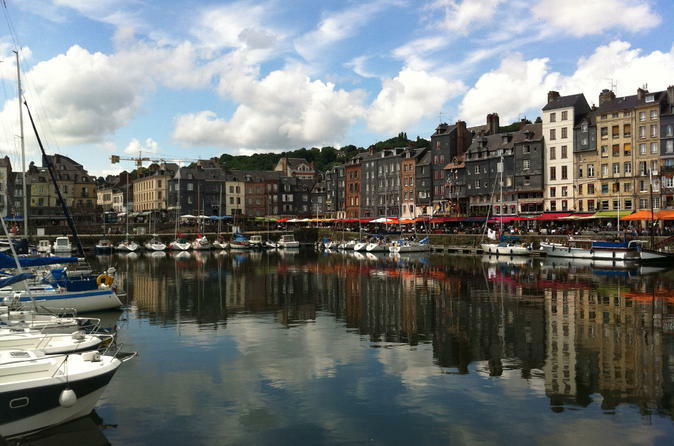 Honfleur, loved by the impressionist painters, was a scenic place with many excellent choices for lunch. And the Normandy Landing beaches were awe-inspiring. The hotel was good, and the dinner (included) surprisingly good, as was the breakfast buffet (also included). The next day the walled city of St. Malo in Brittany was well worth the walking tour, and again there were many fine restaurant choices for lunch. Then there was Mont-St Michel, worth the strenuous climb. Our guide was superb -- knowledgeable, intelligent, humorous and considerate. The bus was reasonably comfortable. There were reasonably timed places for restroom breaks. And the others in the group (all Americans, as it happened) were interesting and kind as well. Worth every penny, and then some. Didn't spend a lot of time at any location..but got to see a lot in the 2 day tour. Highlight was Mount Saint Michel! Very impressive. Had an inspiring visit to WWII Cemetery at dusk with the lowering of the flag in the mist. I was a bit guarded about the overnight stay... was pleasantly surprised with the accommodations, Dinner and Breakfast provided. This trip was a great break in the middle of our 10 day Paris visit. Highly recommend. Our guide was very hard to understand and said "eh" at the end of every sentence. We had very little time at the WW2 sites that were of interest to us. We stopped for 10 minutes at Omaha beach and weren't given any information or history about the events that took place there. Overall very rushed in the places that were of interest to us with very little information about the places we stopped in. It is a packed two days, but nicely laid out. Wonderful trip through history. Easier to take a tour than navigate all the places via rail or car. We thoroughly enjoyed the tour. Very well organized, our guide Veronica was amazing, knowledgeable enough to teach French history. Our driver was very skillful, lots of narrow village roads.Dinner was OK, tiny portions, both my husband and our table mates were still hungry. Breakfast was much better.The woman at check in counter in Paris very rude. The most important part of reviewing a trip is not about the attractions, but about the experience; and our experience was pretty bad this trip. The guides were one of the main problems. A great guide can make history come alive, and make you feel like you are a part of that history. These were not those guides. Our main guide, Veronica, was like that one teacher that puts you to sleep in class. Often times she during tours we would get basic insight into the various landmarks we would visit, but not much else. Compounding this issue was her tendency to say "eh?" at the end of every sentence. To make matters worse, she would often walk off on her own without accounting for the group. During our trip to Honfleur for instance, we became separated from her along with half of the other folks in the group. We all ended up going in separate directions trying to find her, while her monotone voice flitted in and out of range of our headsets! We ended up joining the other guide's tour, who was more lively, but about 10 times ruder. I saw her snip at three or more people during the time we were on the two day trip, including my father. Instead of "eh?" this guide would say "voila!" during every sentence, as if she was performing constant magic tricks. I understand that English is neither of these guides first language, but they were difficult to listen to. Neither guide would stop to allow the group to ask any questions at all, and on the rare occasions someone did ask a question, neither guide would repeat that question to the group and instead answer the mystery question over the headphones. The schedule was the other main issue. Spots like Honfleur and Saint Malo were given too much time and were mainly filler; the guide would only spend about 20-30 minutes with us and then let us loose for lunch. This was a problem in Saint Malo since barely anywhere was open for lunch until about 45 minutes after our guided tour. The places that demanded more time, like Omaha beach, got 15 minutes of time with no real tour. The graveyard at Normandy was such a short stop that I did not have time to walk to the end of it. On the plus side, the hotel we stayed at was recently renovated and very accommodating. The breakfast there was excellent with bacon, sausage, eggs, crossaints, and juice. Even if for dinner we could not agree whether the mystery meat we were eating was pork or chicken.Overall we would not recommend this tour. The tour is expensive and does like to do alot within 48 hours, which was the appeal. We wanted to see the WWII sites and Mt St Michel. The first day felt super rushed, just going from one place to another. You really did not have time to appreciate anything. You also get pointed out sites that you are passing while driving. If you are not on the side of the bus that is facing those things you don't see anything. 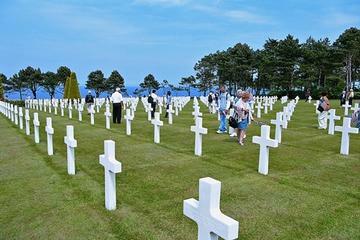 We spent 20 minutes at Omaha Beach and 40 at the American Cemetary. It just isn't enough time. Maybe they could exclude some of the shopping stops for more time? You wanted to actually look around. The hotel for the night was the Novitel Caen. It was a basic 2-3 star hotel. Room was clean and the bed was comfortable. THE DINNER, oh the dinner. When we first boarded the bus in the morning, we were asked if we were allergic to anything, gluten, vegan etc. We aren't. I did not think this was when we were putting in our dinner order. Had I known I would have said ANYTHING other than what they served us. It was chunks of grey veal in a cream sauce, canned carrots and crunchy white rice. I am not certain if the rice was undercooked/overcooked/old. This was one of the worst meals I have ever had. Several people also had moral issues with veal. Hardly anyone ate it. If you book this tour, tell them you want chicken or anything. I can not convey to you how bad this was.  There are also no restaurants in walking distance as well so you are out of luck. Breakfast was fine, nothing special, but fine. THe next day was the morning in St Malo and the afternoon at Mont St Michel. There is a lot of steps at Mon St Michel so be prepared. We did not like our tour guide very much. She just felt like a teacher reciting facts, not very personable. She was openly rude to an elderly man at Mont St Michel who was not in our tour group. Overall I am glad I saw everything but would not book this again. great trip... comfortable bus and accommodations. Informative guide. All transports on time. Highly recommend.